Maverick U.S. Congressman Otis Pike, who died in hospice care in Florida Monday at the age of 92, had an unlikely life for Riverhead son. It was his early days in Riverhead, however, that formed his political views. Mr. Pike was born on Aug. 31, 1921. His parents died when he was six, and he was raised by his older sisters and his aunt. One of his sisters, who was a social worker, once took him out to visit another Riverhead family for dinner during the Great Depression. 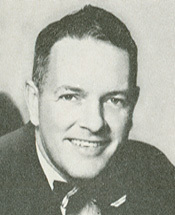 Mr. Pike was a fighter pilot who flew 120 missions in the Pacific Theater during World War II, after which he received his law degree from Columbia University and came home to Riverhead, where he practiced law and served on the town board and as a justice of the peace until he was elected to Congress in 1960. It was then that he began making waves on the world stage. He began questioning Defense Department spending during the Vietnam War, and was credited with killing a $14 million plan that would have given flight duty pay to desk-bound admirals and generals. “If the in-basket is continually loaded on the starboard, or right-hand, side of the desk, and the out-basket is continually empty on the port, or left-hand, side of the desk,wood fatigue sets in, the landing gear tends to buckle and the whole fuselage crashes down on your feet,” he said, receiving a roar of laughter from Congress in response. It was not long after that speech, in 1975, that Mr. Pike was put in charge of the House Select Committee on Intelligence, which was charged with investigating the CIA’s role in coups in Chile and assassinations in other countries, and illegal spying on anti-war protestors at home. He retired from Congress in 1978, telling The Washington Post that the job was no longer fun and that Congress had become dominated by two types of people: millionaires and Boy Scouts. The current House Intelligence Committee Chairman, Mike Rogers (R-Mich.), was one of the first to praise Mr. Pike after he died Monday. “We mourn today the passing of Congressman Otis Pike, who led a groundbreaking House oversight investigation of CIA activities. The U.S. Intelligence Community receives closer scrutiny today than ever in the history of our country. That, in large part, is due to the work of Otis Pike,” he said in a statement to reporters. The East End’s current Congressman, Tim Bishop, agreed. Throughout his life, Mr. Pike spent a great deal of time on boats and in nature, and several preserves on Long Island now bear his name, including the Otis Pike National Wilderness on Fire Island and the Otis Pike Ponds in Calverton. Mr. Pike is survived by his second wife, Barbe Bonjour Pike, his son Douglas, his daughter, Lois Pike Eyre and two grandchildren. HIs first wife, Doris Orth, died in 1996 and his son, Robert, died in 2010. Thanks, Beth, for a great tribute to a great man – Otis was among the East End’s best, and I pass along my condolences to his family as well. I’d like to pass on my sincere condolences to Doug, Lois, and his family.